An all-in-one remote control! 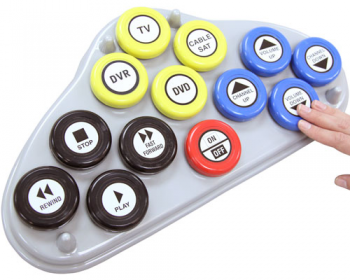 Allows the user to easily see and push buttons to control TV, VCR, DVD, Cable, PVR, and Satellite receivers. It also will control the latest Flat Screen TV’s. The large buttons are very sensitive to touch and have different colors for different group functions. If you cannot push the buttons, there are 14 input jacks for your capability switches.